After leading the Washington Capitals to a victory with a break-out third-period performance, Alex Ovechkin said Saturday night's game shouldn't have reached that point. Although the Russian captain scored a stunning go-ahead goal and set up another in a 5-3 victory over the New Jersey Devils, Washington wasted a 5-on-3 advantage in the second period and gave back a two-goal lead in the first. With the score tied 2-all, Ovechkin got possession in his own zone, streaked down the ice and eluded defender John Moore by pulling the puck behind his right leg to his backhand side. Then he dragged it back across his body in time to fire a wrist shot above goaltender Keith Kinkaid's left shoulder. Ovechkin later fed Marcus Johansson on a power play to make it 4-2, and Matt Niskanen scored an empty-net goal at 17:07 in the third. Adam Henrique, Eric Gelinas and Mike Cammalleri had goals for New Jersey, which lost for the second time in as many days following its 3-1 defeat at home to Winnipeg. Chimera's short-handed goal opened the scoring for Washington, and defenseman Brooks Orpik scored his first goal since joining the Capitals before the 2014-15 season (79 games) to make it 2-0 late in the first. Orpik had missed the preseason with a left wrist injury. New Jersey responded within 22 seconds of Orpik's goal when a wide-open Henrique took Dmitry Orlov's diagonal pass and fired past Braden Holtby to cut the deficit in half. Fewer than three minutes later, Gelinas' slap shot tied on the Devils' second power play. Washington outshot the Devils 11-5 in the second period but failed to capitalize on a two-man advantage that lasted 1:38. Oshie had the best chance of the stretch when the Devils were caught on a line change, but Kinkaid stretched out his right pad to deny the forward. ``Definitely got into the game there,'' said Kinkaid, playing as regular starter Cory Schneider rested following Friday's opener. Moments later at even strength, Holtby denied Henrique on with a similar stop to keep things knotted until Ovechkin's brilliant goal and his cross-ice feed to Johansson. For a team that begins the season with Stanley Cup aspirations, it was a final score that flattered the performance. NOTES: According to the Capitals, Chimera's opening goal marked the first time Washington's first goal of the season came short-handed. ... 27-year-old center Brian O'Neill got a rude awakening in his NHL debut, falling to the ice after a first-period shoulder-to-shoulder collision with Oshie. ... 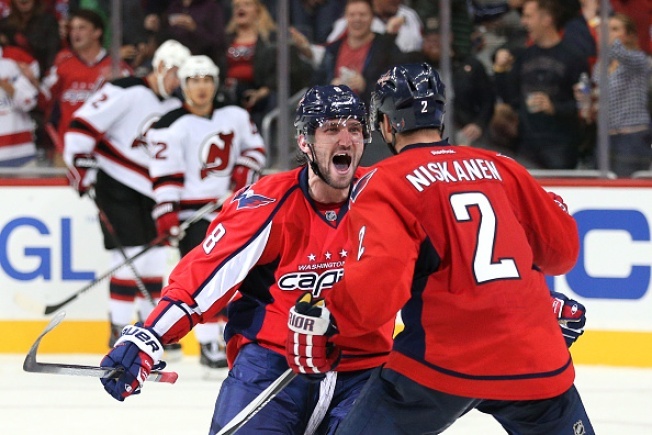 The Capitals were the last team in the Metropolitan Division to play their season opener. ... With Saturday's game, the Devils closed their first of 12 sets of back-to-back games. Their next comes on Nov. 27-28.